Sponsored Post: I am being compensated by #CollectiveBias in partnership with #BioreStripDown for this post. All thoughts and opinions are my own. I wish I could say I had really fabulous plans this past weekend, but that would be a big lie. Lately, we’ve been spending our weekends trying to catch up on cleaning and organizing our house as different parts of our renovation have been completed. Even when I’m busy trying to get chores done, I still try to take some time for myself and relax in between tasks. After all, a weekend has to have a little time for some treat-yo-self action! So how do I pamper myself on a busy weekend? With a DIY facial of course! I had to cancel my most recent facial appointment because of our European trip and can’t get in until later this month… but let’s just say that in the meantime my skin needs some serious help. Airplane air always does a number on my skin, and I’m left with congested skin that’s drier than the Sahara desert. 1. Using my makeup removing wipes, I removed all traces of makeup. 2. Next, I gently exfoliated with a mild cleanser and my face brush. 3. After cleansing my face, I gently patted some fresh warm water on my face to prepare for the Bioré® Self Heating One Minute Mask. 5. After the minute was up, I removed the mask with warm water. 6. 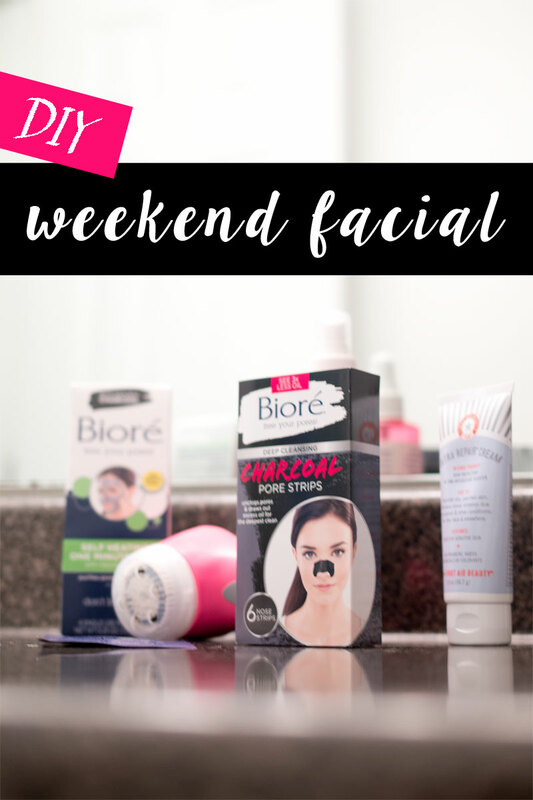 With a clean face, I gently patted warm water on my nose area to prep my face for the Bioré® Deep Cleansing Charcoal Pore Strip. Have you tried these yet? They’re new and like the iconic strip, this charcoal strip unclogs pores to draw our dirt & oil that can cause blackheads! 7. Because I’ve been battling fatigue, I also added some eye patches to the mix. If you have some, you can apply these now too! 9. Follow with a nice cooling face mist, I chose one that has rosewater because it feels so good in the summer heat! 10, Finally, finish by patting on your favorite moisturizer. I was in need of something a little heavy duty, so I chose a thick moisture cream. And ta-da, DIY facial complete! 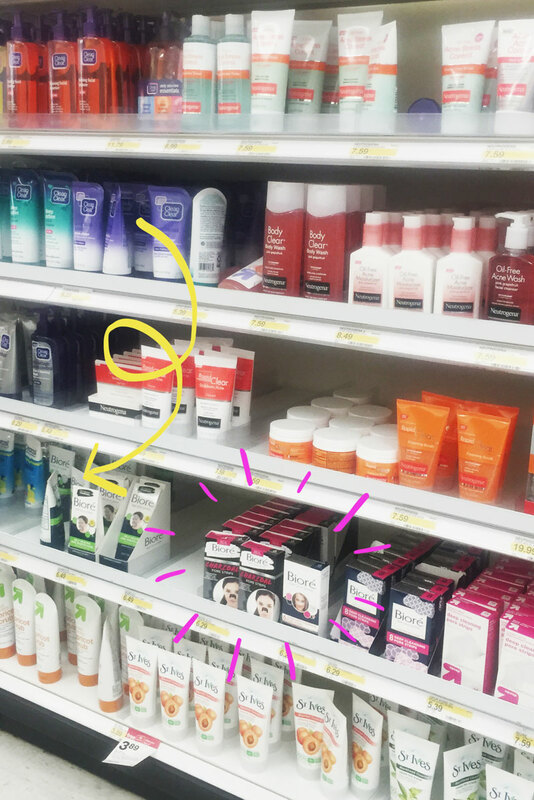 If you’re ready to get your own DIY facial on, head to your local Target to pick up some skin care essentials including the Bioré® Self Heating One Minute Mask and Bioré® Deep Cleansing Charcoal Pore Strips. You can find them in the skincare aisle, as pictured above. Have you tried any of the Bioré® charcoal products yet? Which one is your favorite? Or how do you like to treat your skin at home? I’d love to hear about it in the comments! Oh man, I’ll definitely be doing this on Saturday. I love Biore products! They have always been my favorite! I haven’t tried the charcoal products yet but I really like their self heating exfoliating scrub. It actually smells pretty good and leaves my face so soft and clean. I will have to try out these other ones…and those eye patches! You’d probably love the charcoal heating mask as well then! 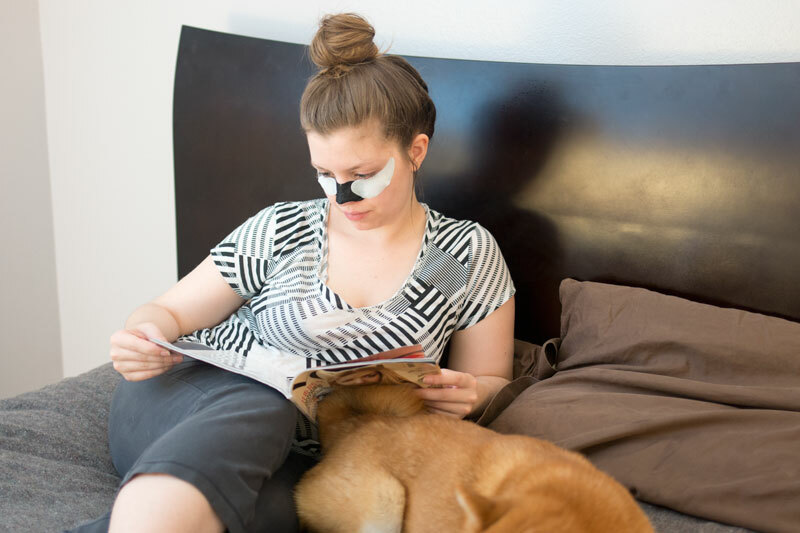 The pore strips are great, and cooling eye patches are so nice when you’re doing a at-home facial! I totally want to do this facial now! I am a sucker for black head strips and these charcoal sound awesome! Love this! I haven’t used Biore strips in a long time. I will definitely be checking these out!! Awesome, hope you like them, Laura! I’ve been wanting to try the Biore charcoal strips for awhile now. I will have to check them out now! Great post! Thanks Mistle! Definitely do – I hope you love ’em! I’ve been debating trying these!! For the most part they’re just like the originals, so if you like those, I think you’d like these too! This looks so relaxing and nice! I need to do something for my skin too! I haven’t tried the new strips yet but i’ve always been a huge fan of the Biore original nose strips. There’s something so satisfying about peeling those off haha. There really is! I love the original Biore strips as well as these! Okay, I’m totally going to get the charcoal strips; I really struggle with blackheads and need something to get them out! Thanks for recommendation! 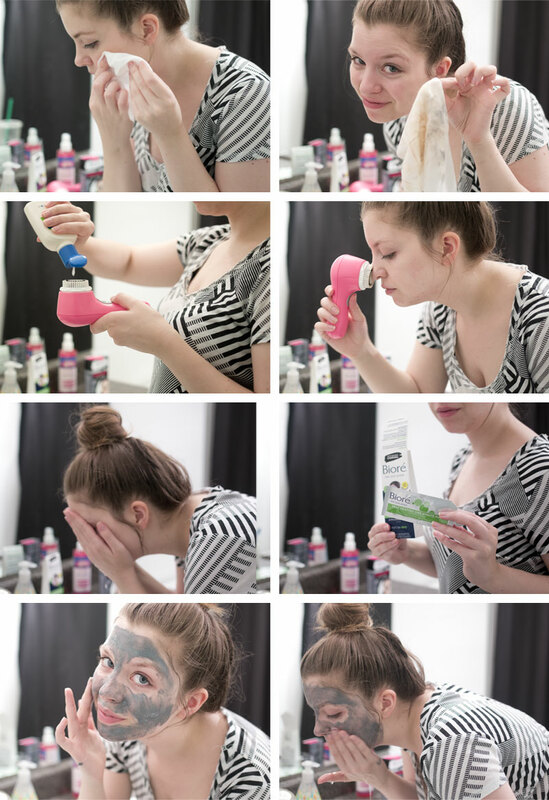 I love the biore self heating mask but I find it often takes me a while to get the entire mask off. 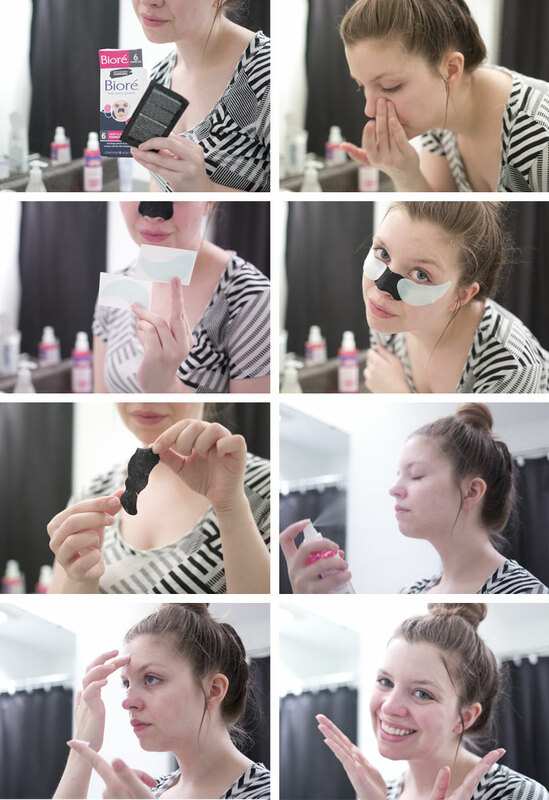 I love pore strips! I think I might have tried all drug store pore strips before, but I haven’t tried Biore. I will include that on this week’s shopping. Thanks! Thank you for the step by step, detailed instructions on how to use this face treatment most effectively. I find that a lot of the time one can have a great set of products, but lack the details and knowledge to utilize these tools best. All in all these helped leave my skin feeling soft and revived.